Laboratory Analyst is a completely technical job profile with little administration responsibilities involved. Those seeking to work as a Lab Analysts should have a relevant qualification of a degree or diploma in subjects like biology, chemistry, microtechnology, etc. As a Lab Analyst, your job responsibilities include conducting scientific tests, analyzing the results, recording the outcomes and maintaining the work-space. 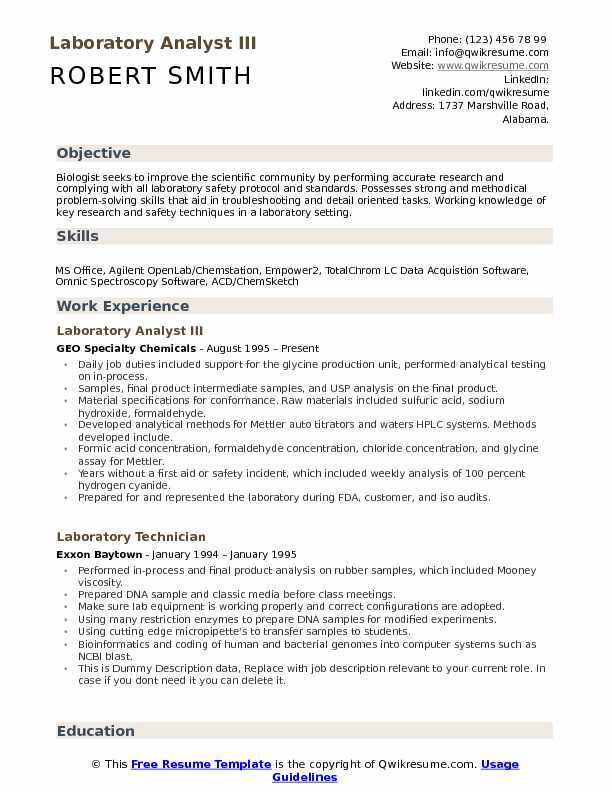 A successful Lab Analyst should possess skills like strong analytical thinking with attention to details, computer proficiency, organizational behavior, and communication skills. 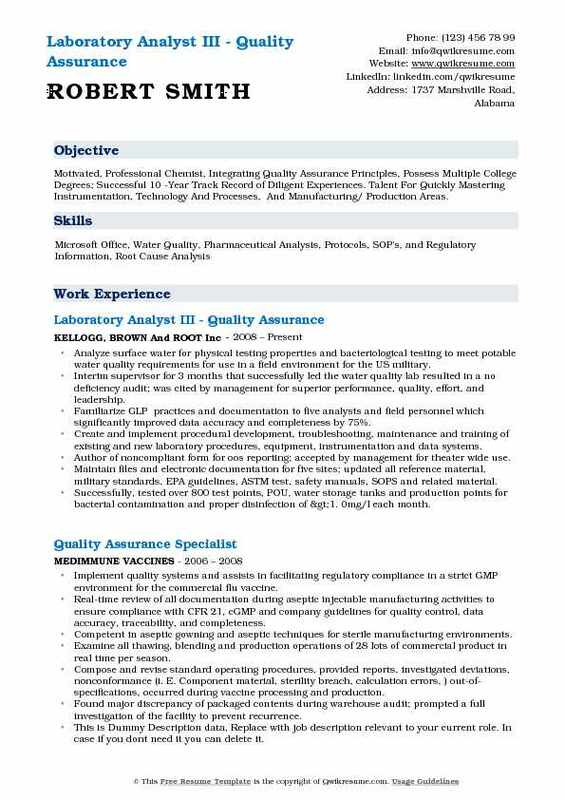 As an aspiring Lab Analyst, prepare your resume by following the guidelines of our Lab Analysts Resume. The position of Lab Analyst is at the entry level but a good opportunity will give you a valuable experience along with higher levels of proficiency to succeed in the future. Summary : Biologist seeks to improve the scientific community by performing accurate research and complying with all laboratory safety protocol and standards. Possesses strong and methodical problem-solving skills that aid in troubleshooting and detail oriented tasks. Working knowledge of key research and safety techniques in a laboratory setting. Daily job duties included support for the glycine production unit, performed analytical testing on in-process. Samples, final product intermediate samples, and USP analysis on the final product. Material specifications for conformance. Raw materials included sulfuric acid, sodium hydroxide, formaldehyde. Developed analytical methods for Mettler auto titrators and waters HPLC systems. Methods developed include. Formic acid concentration, formaldehyde concentration, chloride concentration, and glycine assay for Mettler. Years without a first aid or safety incident, which included weekly analysis of 100 percent hydrogen cyanide. Prepared for and represented the laboratory during FDA, customer, and iso audits. 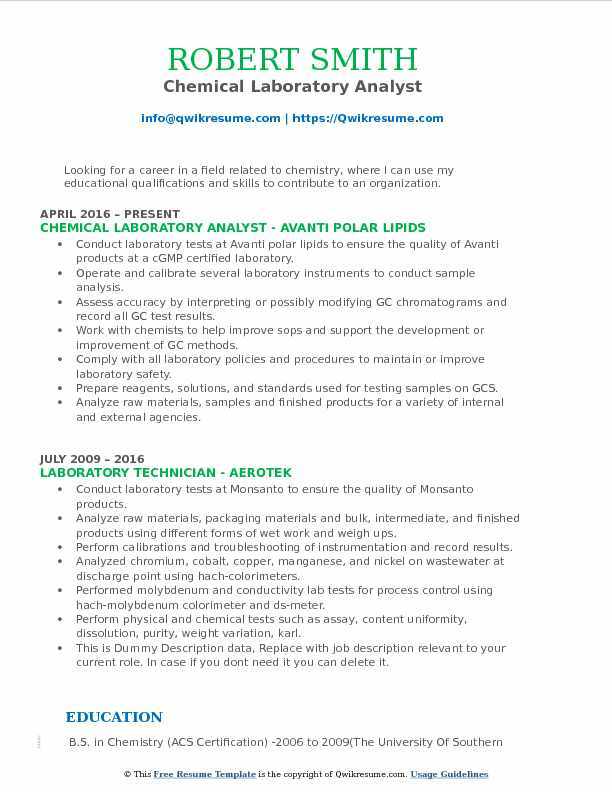 Summary : Dynamic, result oriented Lab Technician with more than 16 years of varied analytical and increasing technical experience in the chemical manufacturing, technical, and pharmaceutical industry. Highly self-disciplined with the ability to prioritize task and work independently with minimum supervision. Resourceful and trainable with readily transferable skills. Execute training of the site lab employees in the most effective and efficient manner with minimum company cost. 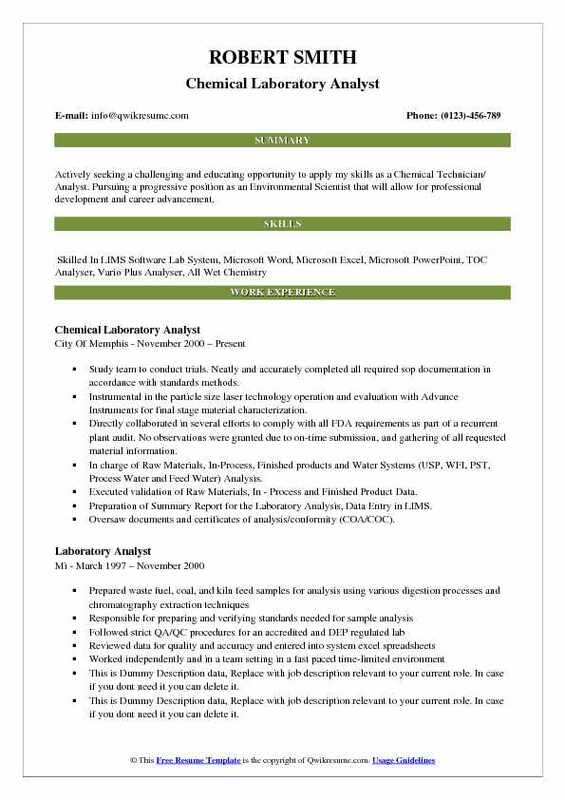 Skills : GC, ChemStation, Baytek, LIMS, ICP-MS, AA, FT-IR, SAP, OMNIC Software, Wet Chemistry, Quality Control, Maintenance And Calibration, Karl Fisher Titration, Good Laboratory Practices, Outlook And Microsoft Office. Conduct testing in accordance with laboratory quality systems to ensure high product quality. Analyze routine and non-routine acetylene, PVP, NVP, pyrrolidone, poly-THF, and THF samples according to strict s. T. I. Procedures. Convey results to data entry via Beckman Lims, sap, daily report forms, and excel spreadsheets. Prepare standards, controls, and solutions resulting in calibrating, troubleshooting, and repairing analytical instruments. Conduct informal walk-through audits, identifying areas of concern and communicating issues to analysts, leads, and team leaders. Create a physically feasible work environment through the 5-s, cGMP guidelines, lean tools, and Sop programs. Execute and implement proper communication (via log book, email, verbally) between fellow analysts, affiliated units that may affect production/plant adjustments, and team leads to giving insight to lab surroundings and affected areas. 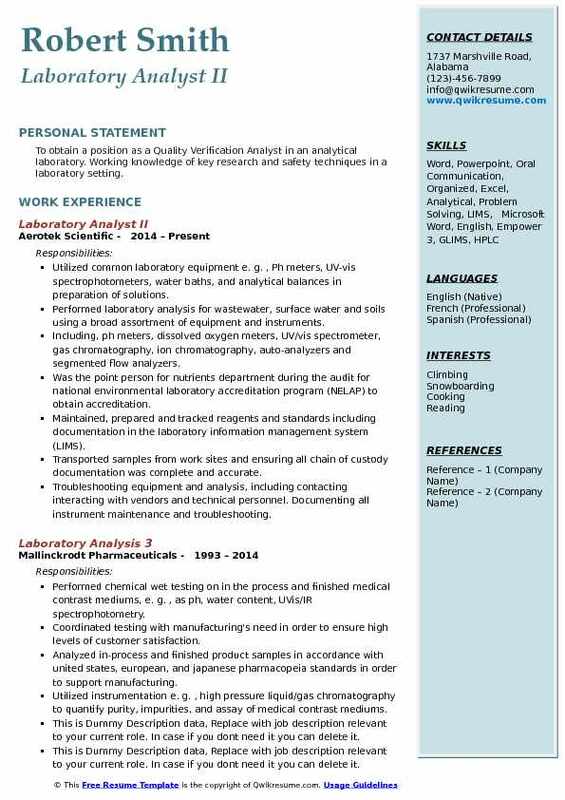 Summary : Actively seeking a challenging and educating opportunity to apply my skills as a Chemical Technician/ Analyst. Pursuing a progressive position as an Environmental Scientist that will allow for professional development and career advancement. Study team to conduct trials. Neatly and accurately completed all required sop documentation in accordance with standards methods. Instrumental in the particle size laser technology operation and evaluation with Advance Instruments for final stage material characterization. Directly collaborated in several efforts to comply with all FDA requirements as part of a recurrent plant audit. No observations were granted due to on-time submission, and gathering of all requested material information. In charge of Raw Materials, In-Process, Finished products and Water Systems (USP, WFI, PST, Process Water and Feed Water) Analysis. Executed validation of Raw Materials, In - Process and Finished Product Data. Preparation of Summary Report for the Laboratory Analysis, Data Entry in LIMS. Oversaw documents and certificates of analysis/conformity (COA/COC). Summary : Analytical scientist with over ten years of environmental science, research, development, and teaching experience in industrial and academic settings. Used to managing multiple projects, delivering reliable high quality results. Seeking an opportunity to utilize and expand my technical skill set in a challenging work environment. Responsible for running tests for 30-50 products a day which equated to over 100 tests a day. Responsible for performing tests such as butterfat testing, taste testing, ph testing, fats analysis, bacteria testing, drug testing on raw milk, microbiology testing, moisture testing, and solids testing. Responsible for communicating with the production team, plant manager, and corporate on the results of tests. Responsible for working at a fast pace daily to ensure product testing was on pace with the production schedule to keep production flowing efficiently. Successfully managed quality assurance activities so all orders were shipped on time. Managed documentation of and training on drug testing procedures, and certification. Created and updated department work instructions and reports on a regular basis. 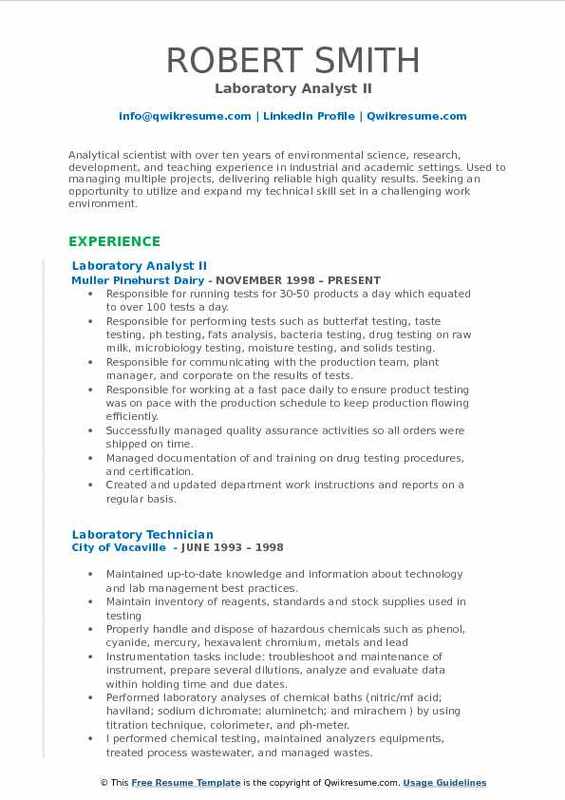 Summary : My chemical background and laboratory skills are developed from many years of regulatory environmental testing and established proficiency with documentation, analysis, and quality assurance. I am proficient with Microsoft Word and Excel with experience writing test procedures and making bench sheets. Responsible for testing wastewater samples from onsite wastewater plant as well as testing drinking water from community systems and construction sites. Physical analysis using a suction filter, oven & furnace to analyze total, suspended & volatile. Biochemical analysis using initial & final dissolved oxygen readings over a five-day incubation of samples to determine oxygen demand. Microbiology analysis to determine total coliform & e. Coli results, notifying drinking water. Photometric analysis using a spectrophotometer to analyze total phosphorus, chemical oxygen. Worked with a software developer to remediate technical issues and customize s/w per test requirements. Successfully redeveloped test to expedite time involved for initial set-up and read-back of data. Summary : Motivated, Professional Chemist, Integrating Quality Assurance Principles, Possess Multiple College Degrees; Successful 10 -Year Track Record of Diligent Experiences. Talent For Quickly Mastering Instrumentation, Technology And Processes, And Manufacturing/ Production Areas. Analyze surface water for physical testing properties and bacteriological testing to meet potable water quality requirements for use in a field environment for the US military. 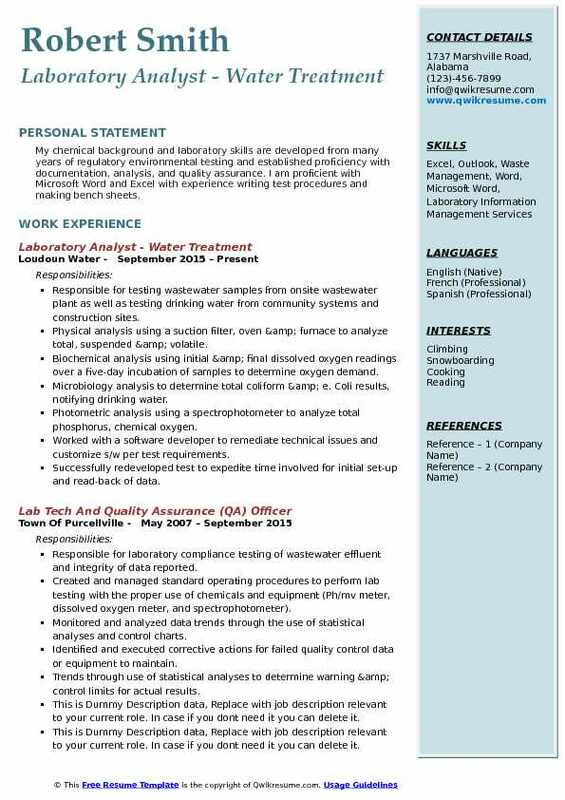 Interim supervisor for 3 months that successfully led the water quality lab resulted in a no deficiency audit; was cited by management for superior performance, quality, effort, and leadership. Familiarize GLP practices and documentation to five analysts and field personnel which significantly improved data accuracy and completeness by 75%. Create and implement procedural development, troubleshooting, maintenance and training of existing and new laboratory procedures, equipment, instrumentation and data systems. Author of noncompliant form for oos reporting; accepted by management for theater wide use. Maintain files and electronic documentation for five sites; updated all reference material, military standards, EPA guidelines, ASTM test, safety manuals, SOPS and related material. Successfully, tested over 800 test points, POU, water storage tanks and production points for bacterial contamination and proper disinfection of >1. 0mg/l each month. 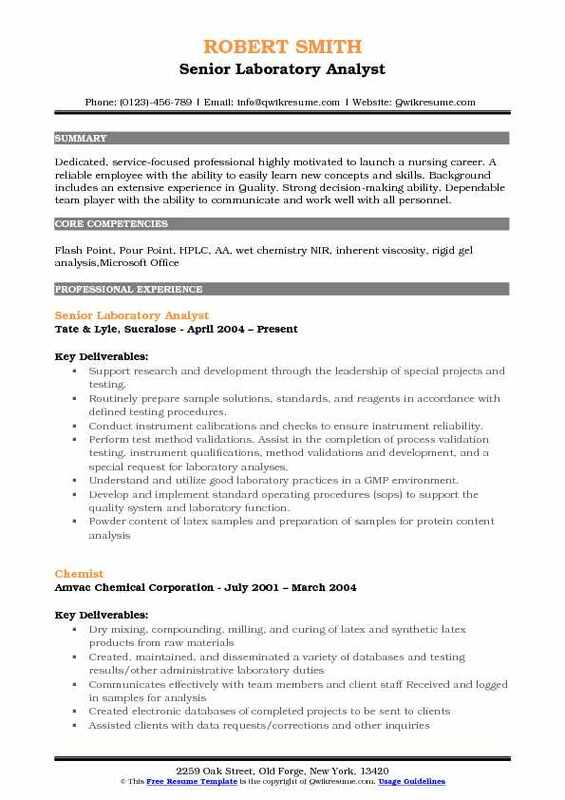 Summary : Looking for a career in a field related to chemistry, where I can use my educational qualifications and skills to contribute to an organization. Conduct laboratory tests at Avanti polar lipids to ensure the quality of Avanti products at a cGMP certified laboratory. Operate and calibrate several laboratory instruments to conduct sample analysis. Assess accuracy by interpreting or possibly modifying GC chromatograms and record all GC test results. Work with chemists to help improve sops and support the development or improvement of GC methods. Comply with all laboratory policies and procedures to maintain or improve laboratory safety. Prepare reagents, solutions, and standards used for testing samples on GCS. Analyze raw materials, samples and finished products for a variety of internal and external agencies. Summary : Dedicated, service-focused professional highly motivated to launch a nursing career. A reliable employee with the ability to easily learn new concepts and skills. Background includes an extensive experience in Quality. Strong decision-making ability. Dependable team player with the ability to communicate and work well with all personnel. Support research and development through the leadership of special projects and testing. Routinely prepare sample solutions, standards, and reagents in accordance with defined testing procedures. Conduct instrument calibrations and checks to ensure instrument reliability. Perform test method validations. Assist in the completion of process validation testing, instrument qualifications, method validations and development, and a special request for laboratory analyses. Understand and utilize good laboratory practices in a GMP environment. Develop and implement standard operating procedures (sops) to support the quality system and laboratory function. 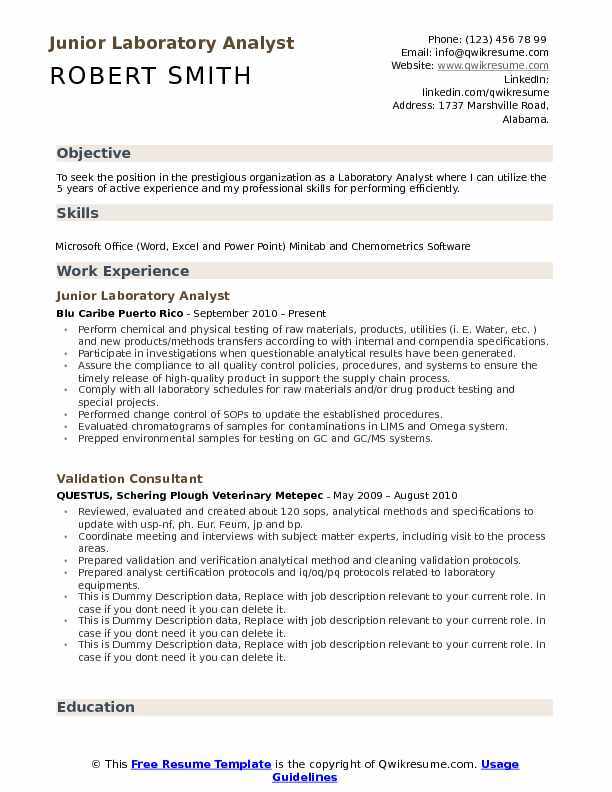 Summary : Experienced, self-motivated, detail oriented, multi-task laboratory professional. Excellent laboratory skills in Environmental Microbiology/Chemistry. Willing to learn new skills. Have strong organizational skills and able to work independently as well as part of a team. Documented preparation information appropriately in the laboratory notebook. Properly operated all equipment/instrumentation that is necessary to support testing. Completed both routine and special quantitative/qualitative laboratory assays and detailed documentation within the deadline, and gained annual bonuses. 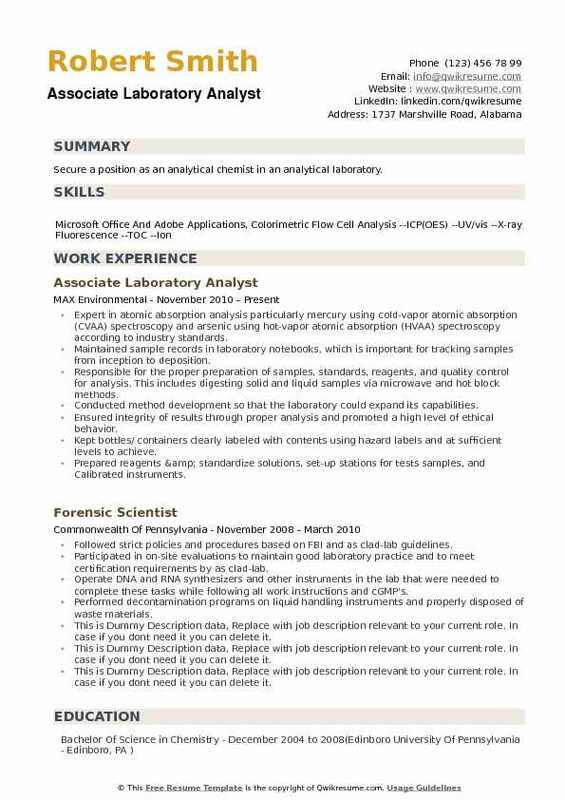 Summary : Secure a position as an analytical chemist in an analytical laboratory. Expert in atomic absorption analysis particularly mercury using cold-vapor atomic absorption (CVAA) spectroscopy and arsenic using hot-vapor atomic absorption (HVAA) spectroscopy according to industry standards. Maintained sample records in laboratory notebooks, which is important for tracking samples from inception to deposition. Responsible for the proper preparation of samples, standards, reagents, and quality control for analysis. This includes digesting solid and liquid samples via microwave and hot block methods. Conducted method development so that the laboratory could expand its capabilities. Ensured integrity of results through proper analysis and promoted a high level of ethical behavior. Kept bottles/ containers clearly labeled with contents using hazard labels and at sufficient levels to achieve. Prepared reagents & standardize solutions, set-up stations for tests samples, and Calibrated instruments. 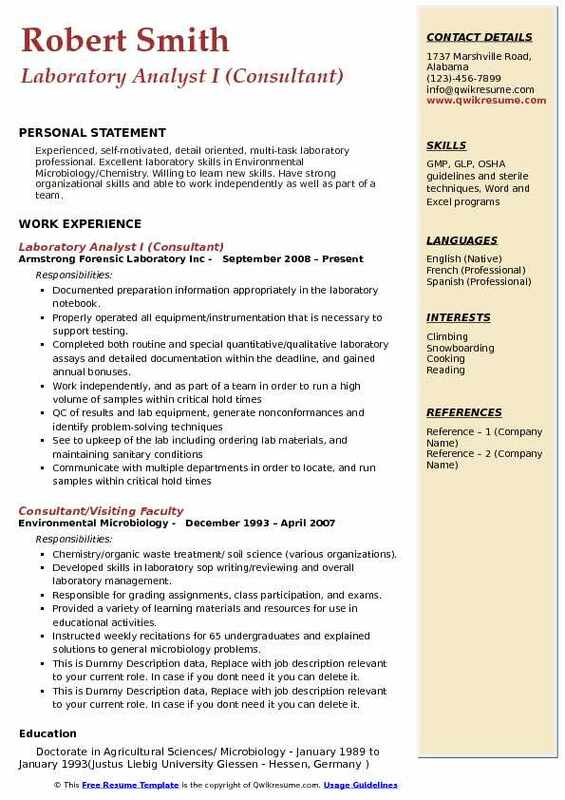 Headline : To seek the position in the prestigious organization as a Laboratory Analyst where I can utilize the 5 years of active experience and my professional skills for performing efficiently. Perform chemical and physical testing of raw materials, products, utilities (i. E. Water, etc. ) and new products/methods transfers according to with internal and compendia specifications. Participate in investigations when questionable analytical results have been generated. Assure the compliance to all quality control policies, procedures, and systems to ensure the timely release of high-quality product in support the supply chain process. Comply with all laboratory schedules for raw materials and/or drug product testing and special projects. Performed change control of SOPs to update the established procedures. Evaluated chromatograms of samples for contaminations in LIMS and Omega system. Prepped environmental samples for testing on GC and GC/MS systems. 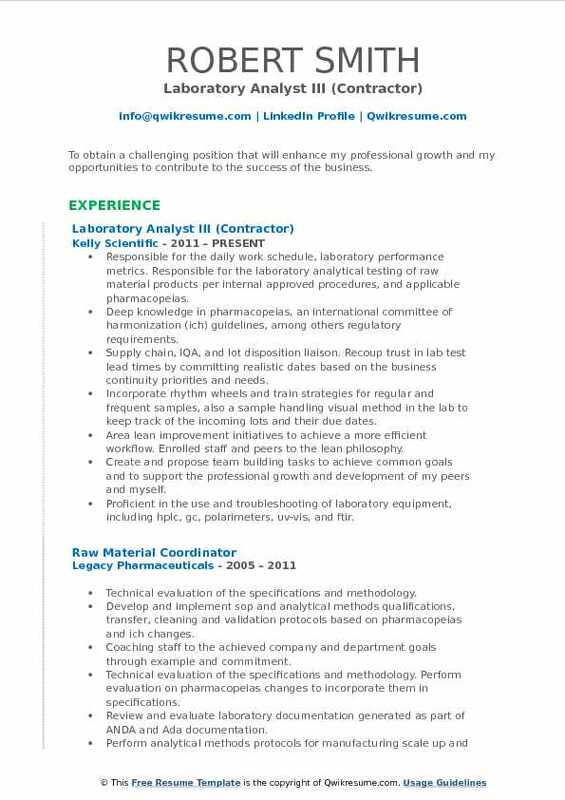 Summary : Science and quality oriented professional with an excellent technical background in chemistry and broad experience in the pharmaceutical industry laboratory operations. offering laboratory equipment qualification, test method transfer, analytical method development, laboratory chemical inventory controls, analytical data review, and approval. Conduct chemical testing and validation studies using HPLC and other laboratory equipment, for pharmaceutical products quality requirements, raw materials testing to ensure pharmacopeia compliance and another special sample testing. Perform quality testing to finished product and in-process validation samples following applicable sops with appropriate sample handling and quality data control. Perform test solutions and waste disposal according to approved quality and safety procedures. Process and review laboratory data and results using computer systems such as empower 2 and Lims Ver. 4 approve a certificate of analysis and analytical reports for quality standards compliance, following documentation guidance of good laboratory standard practice. By evaluating the analytical results, equipment qualification, product trend, and history, method validation, manufacturing notes as required and then documenting and submitting the investigation report for additional quality revision and approval. Approve laboratory analytical raw materials and finished products for final release and disposition. Approve final certificate of analysis of in compliance manufactured products. Implement and monitor compendia method changes applicable to drug substances and raw materials meeting regional teams to assess the impact and harmonize procedures. 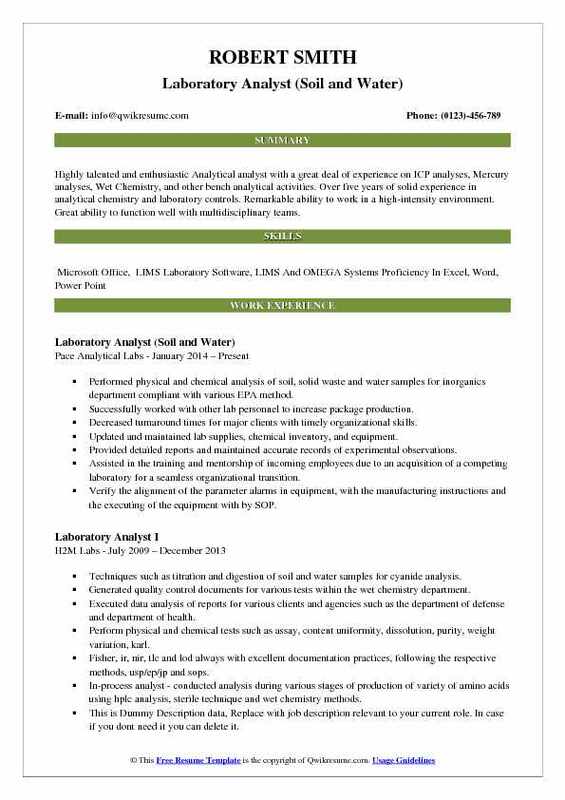 Headline : Highly talented and enthusiastic Analytical analyst with a great deal of experience on ICP analyses, Mercury analyses, Wet Chemistry, and other bench analytical activities. 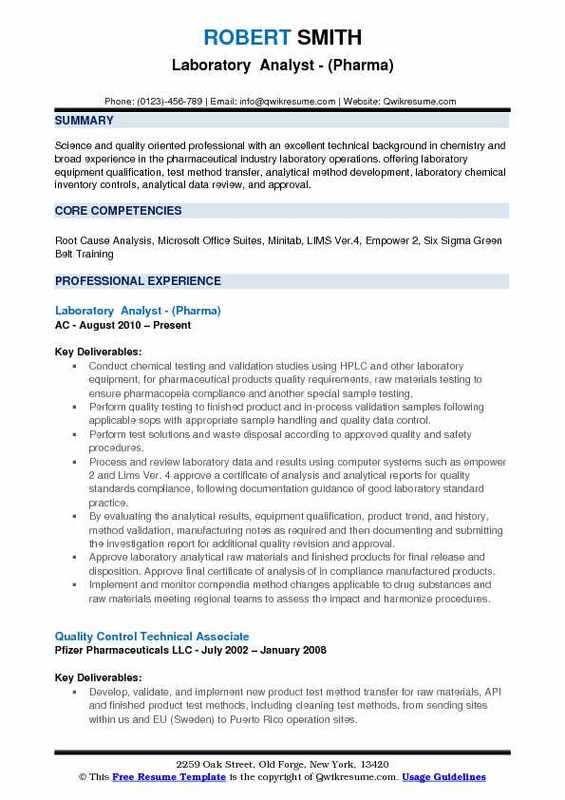 Over five years of solid experience in analytical chemistry and laboratory controls. Remarkable ability to work in a high-intensity environment. Great ability to function well with multidisciplinary teams. Performed physical and chemical analysis of soil, solid waste and water samples for inorganics department compliant with various EPA method. Successfully worked with other lab personnel to increase package production. Decreased turnaround times for major clients with timely organizational skills. Updated and maintained lab supplies, chemical inventory, and equipment. Provided detailed reports and maintained accurate records of experimental observations. Assisted in the training and mentorship of incoming employees due to an acquisition of a competing laboratory for a seamless organizational transition. Verify the alignment of the parameter alarms in equipment, with the manufacturing instructions and the executing of the equipment with by SOP. Summary : To obtain a challenging position that will enhance my professional growth and my opportunities to contribute to the success of the business. Responsible for the daily work schedule, laboratory performance metrics. Responsible for the laboratory analytical testing of raw material products per internal approved procedures, and applicable pharmacopeias. Deep knowledge in pharmacopeias, an international committee of harmonization (ich) guidelines, among others regulatory requirements. Supply chain, IQA, and lot disposition liaison. Recoup trust in lab test lead times by committing realistic dates based on the business continuity priorities and needs. Incorporate rhythm wheels and train strategies for regular and frequent samples, also a sample handling visual method in the lab to keep track of the incoming lots and their due dates. Area lean improvement initiatives to achieve a more efficient workflow. Enrolled staff and peers to the lean philosophy. Create and propose team building tasks to achieve common goals and to support the professional growth and development of my peers and myself. Proficient in the use and troubleshooting of laboratory equipment, including hplc, gc, polarimeters, uv-vis, and ftir. Decision making and goal orientation using different techniques like lead by example and engaging staff based on their personalities. 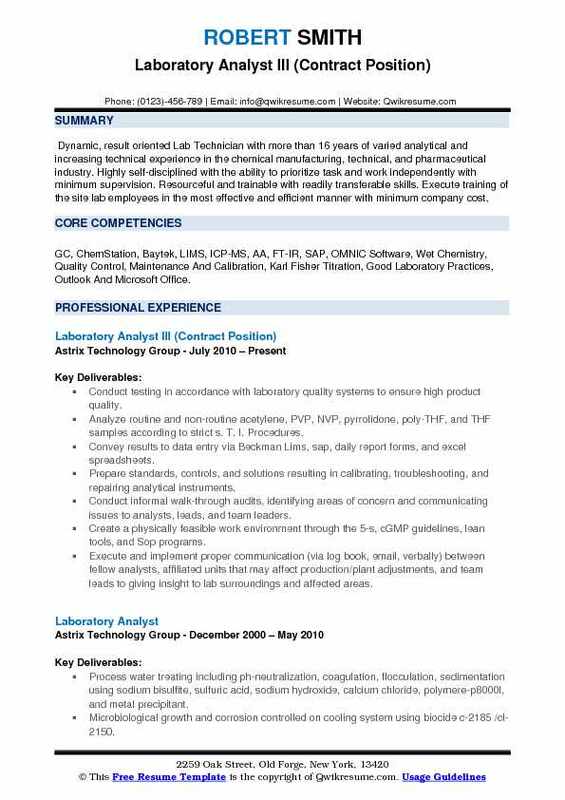 Summary : To obtain a position as a Quality Verification Analyst in an analytical laboratory. Working knowledge of key research and safety techniques in a laboratory setting. Utilized common laboratory equipment e. g. , Ph meters, UV-vis spectrophotometers, water baths, and analytical balances in preparation of solutions. Performed laboratory analysis for wastewater, surface water and soils using a broad assortment of equipment and instruments. Including, ph meters, dissolved oxygen meters, UV/vis spectrometer, gas chromatography, ion chromatography, auto-analyzers and segmented flow analyzers. Was the point person for nutrients department during the audit for national environmental laboratory accreditation program (NELAP) to obtain accreditation. Maintained, prepared and tracked reagents and standards including documentation in the laboratory information management system (LIMS). Transported samples from work sites and ensuring all chain of custody documentation was complete and accurate. Troubleshooting equipment and analysis, including contacting interacting with vendors and technical personnel. Documenting all instrument maintenance and troubleshooting.